When you work in an office, the temptation to go out to eat for lunch is real. My first two jobs were smack in the middle of Back Bay, Boston with access to lots of good food (and shopping…oh, the shopping!). Sometimes my co-workers and I would grab sushi, or salad bar and soup, and other times we’d opt for falafel or Indian food—it was delicious, but I was easily spending $10-15 (or more) every weekday on lunch alone and my clothes started feeling snug, despite my almost-daily gym habit. That’s when I decided I needed to start bringing my lunches from home, and they needed to be healthy as well as tasty enough to compete with the nearby restaurant options. Now that we’re well into February and motivation to keep up with our resolutions to eat more healthfully this year may be waning (I feel you! ), I thought I’d post a handful of my favorite portable lunches. These meals travel really well, and none of them require any re-heating via stovetop or microwave. And because I regularly get asked about how I store my meals, I recommend getting yourself a set of these Snapware glass containers. They’re dishwasher and microwave-safe, and since I’ve been using them over the last handful of years, I’ve experienced zero problems with leaking—even when it comes to salad dressings. 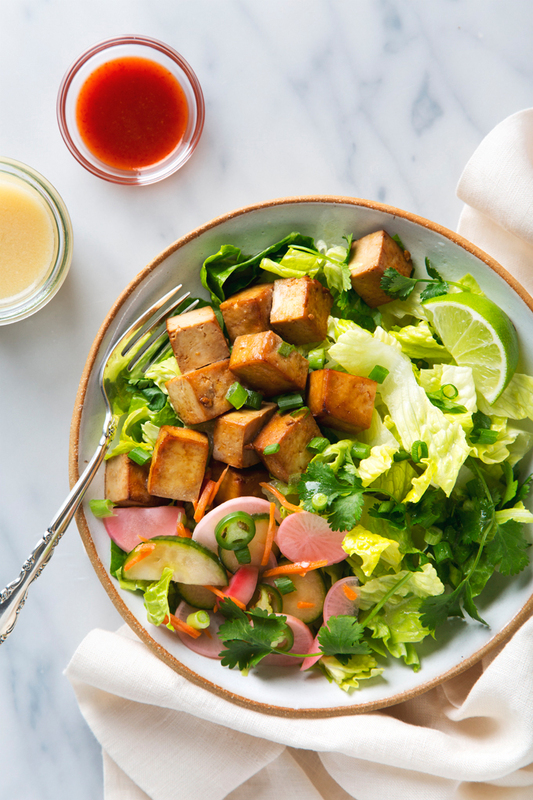 I straight-up love the flavors of banh mi, so of course I had to include this lighter salad version at the top of my lunch list. First you make the quick pickles, then you marinate/cook the tofu (seriously one of the tastiest ways to make tofu), and then you make the dressing (a super speedy mix of fresh lime juice, vinegar, sesame oil, and miso). Each component is really simple and most things can be made in advance, if you’d like to break up the prep work. 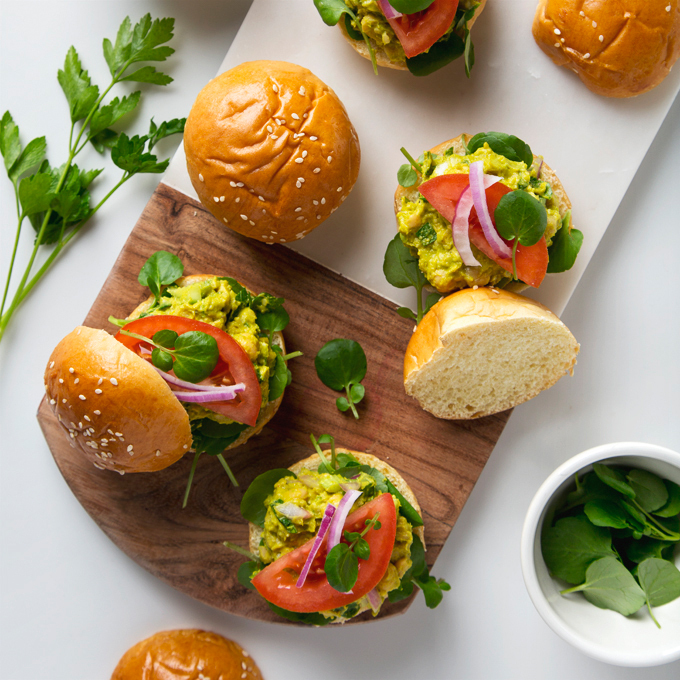 These easy sandwiches are my equally protein-packed but much less stinky take on the classic egg salad sandwich, using chickpeas instead of eggs and mashed avocado instead of mayo. 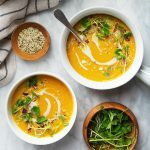 They’re made with lemon juice for brightness, tahini and turmeric for a little earthiness and anti-inflammatory power, and diced celery and red onion for crunch. I like to serve my chickpea salad on mini slider buns, but it’s also great in lettuce or collard green wraps, or open-faced on toasted brown rice bread if you’re gluten-free. 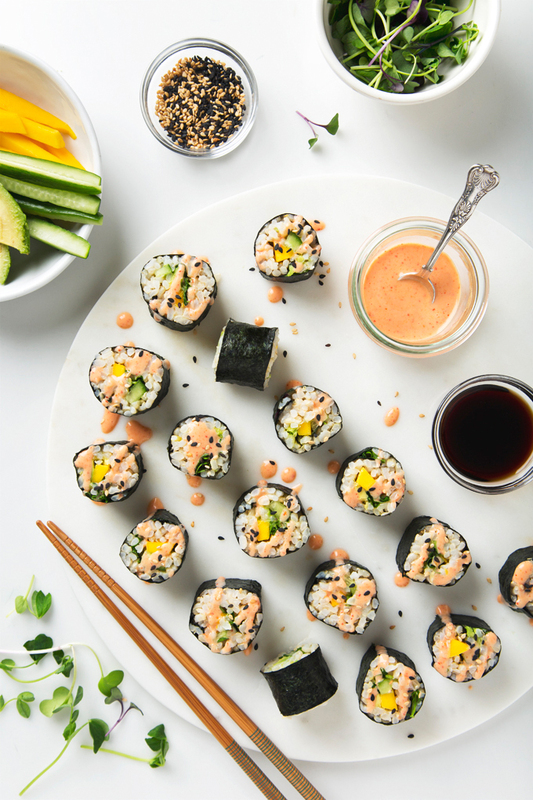 Brown rice sushi with sweet mango, crisp cucumber, creamy avocado, and healthy micro greens. I recommend packing a couple of small containers of spicy sriracha mayo and soy sauce for dipping—you won’t miss that pricier sushi restaurant one bit. This salad is all about that sweet/salty/vinegar-y dressing! You can use olive oil or tahini (I like tahini), and feel free to get creative with the toppings to keep things interesting. 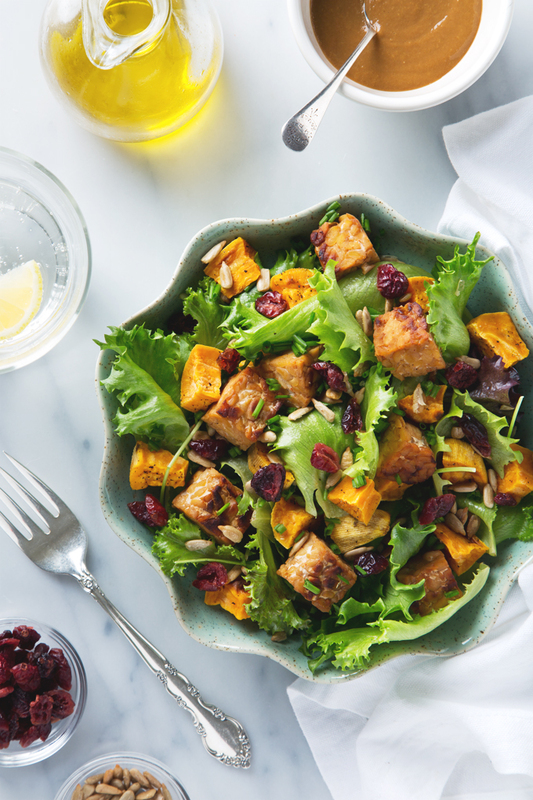 One of my go-to variations (pictured above) is to use baby lettuce in place of arugula, yams instead of sweet potatoes, and then I top my salad with dried cranberries for extra color and texture. This is a very satisfying and adaptable recipe. Protein-rich red quinoa and black beans, fresh pico de gallo, creamy avocado, and crunchy baked tortilla strips. 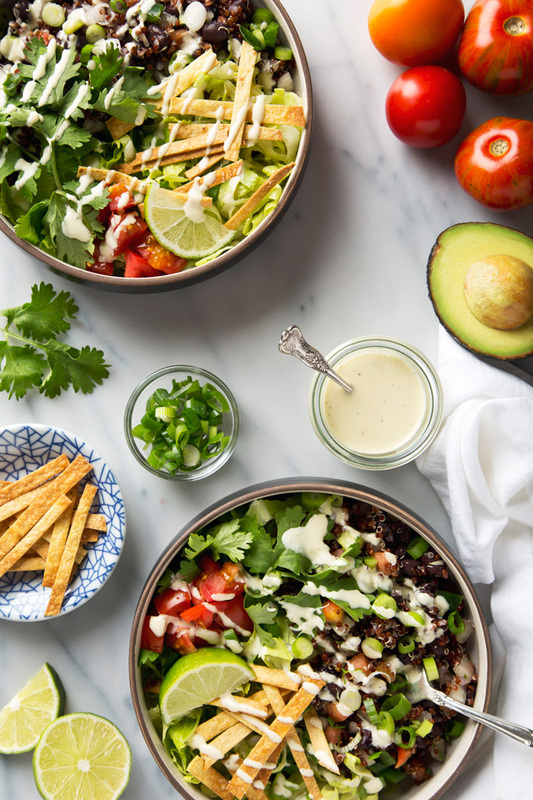 This salad checks all of the flavor and texture boxes and the 4-ingredient Garlicky Cashew Cream Dressing is sure to make you swoon. Pro tip: pack your tortilla strips separately to keep them nice and crispy. This peanut sauce. Can we just take a moment? It’s one of those grab a spatula and when no one is looking, straight from the blender and into your mouth sauces. It’s creamy, salty but a little bit sweet, tangy, extra peanut buttery, and just hot enough thanks to the fresh ginger and red chili paste. 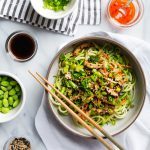 This Chinese-inspired dish is made with chewy soba noodles, sliced cucumbers, carrots, and scallions, and topped with black sesame seeds and chopped salted peanuts. It’s one of my favorite recipes to come out of my kitchen and it’s about a million times better for you than takeout. Filed Under: recipe roundup COPYRIGHT © 2019 Amanda Maguire. All Rights Reserved. 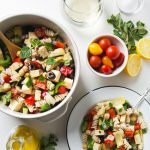 What a stellar round up of recipes! 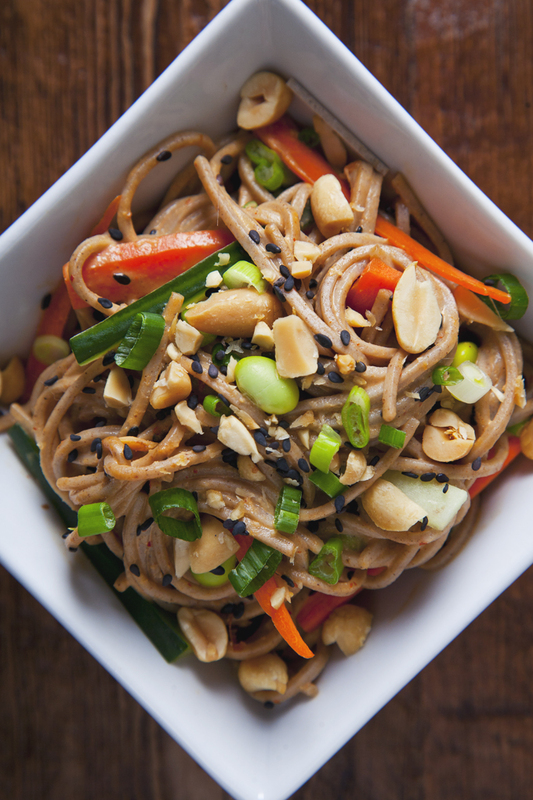 Those peanut cold sesame noodles are calling me name. Yum! These lunches look delicious and a lot healthier than the food options near my work. Packing lunches that keep me interested has been a struggle lately and your post is just the inspiration I need to get back to healthier eating. Thank you! The lunch struggle is REAL, Abbot! 😉 I hope these recipes make your life a little easier (and lunches a lot tastier). I’m making your Quinoa Taco Salad for dinner tonight! Yay! I hope you love it, Carrie! The quinoa taco salad was delicious! I especially loved the garlic dressing and the tortilla strips on top. Thank you for another recipe that I’ll be making again very soon!